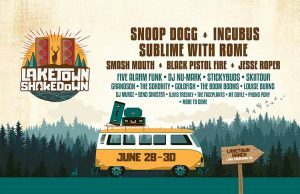 Snoop Dogg, Incubus, Sublime with Rome, Black Pistol Fire and Smash Mouth are among the top names for the 2019 Laketown Shakedown taking place at Laketown Ranch in Lake Cowichan Friday June 28 to Sunday June 30, 2019. The lineup has been announced. The revamped festival formerly called Laketown Rock combines rock elements of it’s original iteration and the more varied Laketown Shakedown events the venue hosted last summer. Metchosin’s Jesse Roper and Kelowna DJ Stickybuds will headline the shorter opening night.